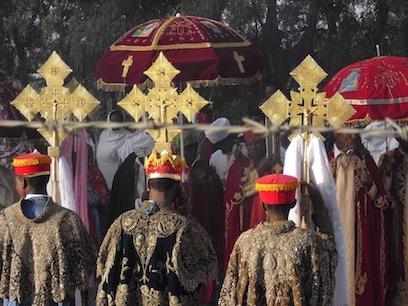 January in Ethiopia…I was fortunate to attend the Ethiopian Orthodox Church’s Timkat celebration in the town of Axum and witness its colorful pageantry. It is said there that when the Queen of Sheba visited King Solomon, she conceived a son by him. When that son, Menelik, became a man, he journeyed to visit his father, King Solomon. As a sign of his affection, King Solomon gifted the Ark of the Covenant (the tablets with the Ten Commandments given to Moses) to this son who brought it with him on his return to Ethiopia. 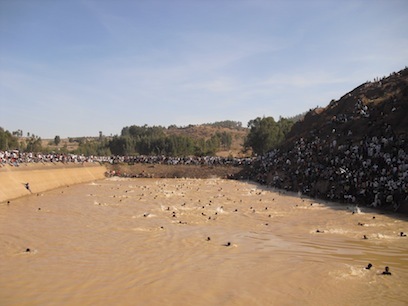 At any rate, even historians agree that Ethiopia is one of the first places to be converted by the apostles after Jesus was crucified (executed). 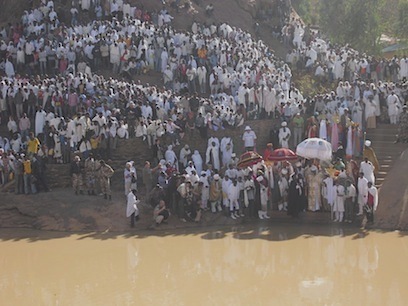 The holy festival of Timkat in the Ethiopian Orthodox Church celebrates the baptism of Jesus in the River Jordan by John the Baptist. This ceremony concluded at a huge man made pool that was said to have been the Queen of Sheba’s bath. Each church has its own Ark of the Covenant replica kept in a special sacristy. On the eve of the festival, the many priests parade the Ark of the Covenant to an place where a night vigil is kept. (This spot is near water, whether a lake or a big pool.) 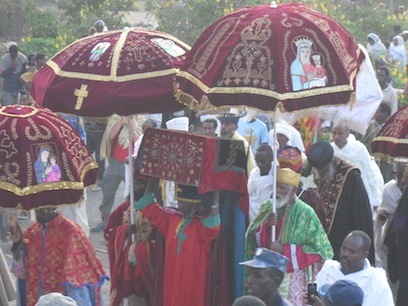 The processions were long and full of orderly priests in embroidered robes and caps. In Axum, two priests in simpler clothes led; one danced and one played the masenqo ( a stringed instrument). Many in the procession carried huge embroidered umbrellas. The Arc of the Covenant was somewhere toward the middle of the procession; one priest carried it over his head and he was flanked by two priests with large, ornate umbrellas. Unlike any local church festivals I’ve attended at home, the crowd was huge. It was more than enough people to jam pack a football field. And it was a very local event with a religious feel. That next morning, with just as much ceremony, the Ark of the Covenant was taken out of its enclosure for a celebratory service. I was touched by the graciousness of the clergy toward western tourist cameras, truly exemplifying the “turn the other cheek” notion found in the Bible’s New Testament. I vividly remember a seated priest in splendid robes, clearly a dignitary among dignitaries, being pushed to the side of his bench by western camera-woman until she had enough room to stand on his bench to take photographs. He briefly glanced at her dusty boots and then returned his gaze to the ceremony. She seemed oblivious, but I cringed for her. At the close of the morning service, the Bishop and priests, in what seemed their final procession, walked to the water’s edge. I ran toward then water too and sat on a stone overlooking the water from the far side. Once at the water, the bishop raised his staff and offered a prayer before touching his cross to the water, to bless it. Immediately, the two priests on each side of him steadied the Bishop away from the water’s edge. At the same time, people jumped in the water from all directions. That continued for about 15 minutes, and I was braced all the while so I didn’t get knocked into the water by the enthusiastic celebrants jumping past me to jump 20 feet down into the water. After that subsided, onlookers threw plastic water bottles in the water that the swimmers retrieved and filled and then tied to a line. The line would be pulled up with the full bottle of water. Once the line was pulled up, the bottle of water was untied, opened and sprayed on the remaining dry crowd. Some in the crowd took a bottle of water away with them so family or neighbors too infirm to attend the ceremony could be baptized with Timkat holy water. I was drenched.